Tusker Project Fame Season Five winner Ruth Matete continues to lament on why she enrolled for the show which was sponsored by an alcoholic brand. Yet again, Matete has shared that she deeply regrets participating in the event because of the sponsors. She however revealed that she was in deep financial stress a reason why she took part in the event. “Around that time, I was so stressed and I had financial difficulties. It was not a good gesture as a Christian. Even then, I knew I was wrong, but because in life we have ups and downs, no one should lie to you that after salvation everything is fine,” she said in an interview with Radio Jambo. Not happy Her friends pushed her to try her luck in the widely televised event but her parents were also not happy about it. ”At that time, one of my friends advised me to try Tusker Project Fame. I hesitated but finally ended up going because of the frustrations of life, without even thinking about my salvation life.After TPF, there were so many gigs for me. Most people did not know I was saved. When I went back to church, there was a lot of drama, but I admitted I was wrong,” she said. 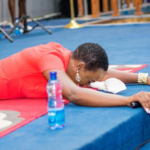 The post Born again Christian Ruth Matete says she regrets participating in beer-sponsored singing competition TPF appeared first on Ghafla! Kenya.